I often look for similar sites when I am searching for affiliate programs to promote, so I can get the best commission, and compare other elements of the affiliate programs. Typically, I use Google to search out sites, but I came across SimilarSites.com, which makes the process more efficient, since it enables me to enter a domain and get results of similar sites. The queries are not limited to searching the domains themselves. For instance, I searched the URL for the Amazon affiliate program, and the results included CJ.com, ClickBank, LinkShare, eBay Partner Network, AzoogleAds, ShareASale, and Google AdSense. 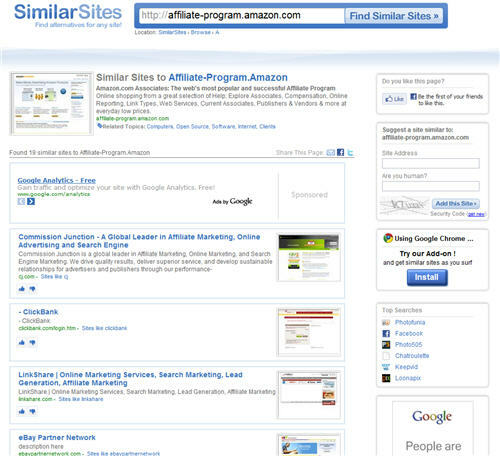 This could be a good tool for affiliate managers to find similar niche sites, too. And if you’re using Google Chrome, there is a Similar Sites add-on. I had a fun chat with Deb Carney on her AffiliateABCs podcast the other day about my early days in affiliate marketing. This discussion came out of a link I Tweeted recently for an article I wrote in 2000 on the history of affiliate marketing. We touched on the origins of the industry, as well as my start as an affiliate and an affiliate manager in 1997 at Medsite.com. Back when I started as an affiliate, I joined the Amazon.com affiliate program and created a horrible site on AOL, which was a shoddy guide to New York City. I got my first domain, velocitynyc.com, on August 25, 1998. This was an online version of a zine, Velocity NYC, that I was publishing offline for a few years. This domain is now used for the Velocity NYC Press, a book publishing imprint from Affiliate Summit. My second domain, babylounge.com, was registered on July 19, 1999, and the initial purpose was to manually create online birth announcements, after lots of friends and family enjoyed the one I created for my first daughter months before. These online birth announcements were available in a free version (with affiliate ads) or a few paid versions. As of today, I’ve got 152 domains, and I couldn’t even tell you how many have been affiliate sites, or are currently affiliate sites. Plus, there are many domains that I grabbed for a year or two for projects and let go. Anyhow, the podcast also gets into my experiences in the early days as an affiliate manager and it’s a fun trip down memory lane for the resources and such from back then. Have a listen to episode 19 of Affiliate ABCs to hear how things used to be in affiliate marketing. I understand that you prohibit including affiliate links in Twitter, since an account there is not owned by the affiliate. Just wondering if you can clarify where the line in the sand is drawn – if I have a blog on WordPress or Tumblr, where it’s my site, but on their servers as a subdomain, is that my site? I have reviewed the Twitter site and approved its addition to your Associates account. Links established through this URL to Amazon.com will qualify for referral fees. We ask that you add this URL to your account online. Please follow these steps after logging into http://associates.amazon.com. Click on “Account Settings” in the upper right-hand corner of the main page. In the description field titled, “Briefly describe your web site” in the center of the page, add the new URL(s). 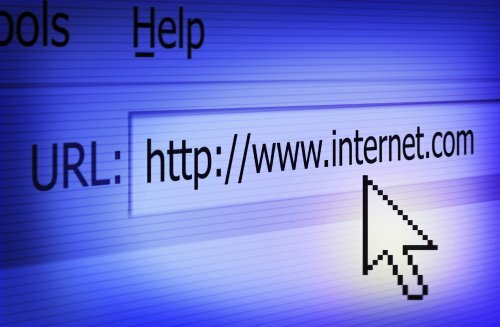 Be careful not replace your existing URL displayed in the box titled, what is the URL of the main web site. Click on the “Save Changes” button at the bottom of the page to save your changes. If you would like to add your WordPress page or Tumblr, you will need to provide us with the URL so we can review the sites and okay their addition as well. That is certainly reasonable to me. Affiliates should list all URL’s they will be using to promote an affiliate program, so the affiliate manager can review them. Anyhow, I’d forgotten about all of this until an email came in today in response to getting a rejection email for the Affiliate Summit affiliate program. That is fine, I really did not care for the attitude anyway ! This is good example of stupidity ! You have no idea what web site I going to promote it on, what blogs I may have, what social sites or forums I have a following on, so how do you know if I am suited to your snooty program ?? Exactly. We had no idea about this affiliate’s relevant sites, because they were not in their profile. There were a handful of other sites and descriptions listed, all of which were for a vertical that has absolutely nothing to do with our affiliate program. Moral of the story… if you’d like to participate in the “snooty program” for Affiliate Summit, please include your sites in your profile. You’ve probably heard by now that the Federal Trade Commission announced new rules yesterday regarding disclosure of freebies and financial interests by bloggers. But what does that mean to you when it kicks in on December 1, 2009? I am fortunate to be a part of a secret cabal, and I heard about the new rules early on from Dan Murray, Internet Marketing Strategist and Founder of Ravenwood Marketing, Inc. There was a lot of discussion about the new FTC rule, and Tim Carter, nationally-syndicated newspaper column Ask the Builder and the founder of AskTheBuilder.com shared his disclosure policy. I read through that disclosure policy and grabbed some elements to add to my own disclosure policy, which is now linked from the bottom of all of my blog posts on the site and in the RSS feeds. Now please note that if you choose to be “inspired” by either of these policies, you should do so at your own risk. Neither of us claim to be lawyers or anything like that. We’re just trying to do what’s right here. I am hoping to get some direction from affiliate programs and networks, but I’ve only gotten information on the FTC issue from ShareASale, so far. I’ll keep an eye out for more news from affiliate programs and networks. I’ve been hearing a lot about AffiliateReporting.com, but hadn’t had a chance to dig into it until this week… and I am very impressed. If you’re not familiar with AffiliateReporting.com, it’s a search engine marketing (SEM) software platform designed for affiliates. The suite of SEM tools come from m o v e software, and the software was developed for m o v e marketing, a Commission Junction Performer and winner of the CJ Horizon Award For Innovation, that generated over $20 Million in affiliate commissions from over 500 advertisers using these SEM tools. After playing with their tools, I touched base with the folks at AffiliateReporting.com, and they were willing to provide an extended free trial – usually it’s 14 days, but if you use this link you’ll get 30 days. Please note, this 30 day trial offer expires on October 16th at midnight PST. AutoSYNC: loads reporting data from the most popular search engines and affiliate networks. AutoBID: intelligent systems use key performance metrics to automate bidding, so no human intervention or setup is required. AutoCOPY: replicates campaigns across multiple search engines in a single click. Alarms: monitors changes in CPC, click volume, and other key metrics as often as every 5 minutes. The dashboard (see below) provides critical information at login, such as Daily Profit & Loss Graphs, Biggest Winner’s and Loser’s Summary, and Alarms. There are dozens of reports for affiliates to analyze profit by ad, site, search engine, campaign, ad group, and keyword. Keyword level reports like the Biggest Winners and Losers (see below) bring attention to the keywords that need immediate attention. And then the Keyword Manager (see below) allows affiliates to drill-down into detail on a single keyword to analyze performance, change bids, or modify alarm settings. It also houses a number of useful SEM management features. Check it out at AffiliateReporting.com for more details and to take advantage of the free 30 day trial. I am a big advocate of offering email as a subscription option for RSS feeds. Not only does it give people another choice to consume RSS feeds, but this option has been far more popular among reader of my blogs than subscribing with RSS readers. There are various ways to do this, but I’m going to share how it’s done via AWeber, since that’s the vendor I use. In addition to the ability to collect emails for RSS feeds via AWeber, they also enable you to build email lists for newsletters, autoresponders, and more. Anyhow, when you’re in AWeber, you can start an RSS opt-in list by going to “Blog Broadcast”. It’s an intuitive process where you setup the email subject, select a template (or design your own HTML), choose frequency, whether you want click tracking, etc. I have a number of different RSS lists going, and some drop daily, while others go out weekly. The default for the subject in your emails is the name of the RSS feed. Based on feedback I received (people thought I kept sending them the same emai), I changed the subject in the interface, so the email subject is always the title of the first blog post in the email. I’ve seen my open rates increase since that change. There is also an option to have your RSS email subjects syndicated to Twitter through an AWeber account. One of the key tactics for an affiliate is redirecting and/or cloaking affiliate links. Affiliates cloak their links for a variety of reasons, but I do it so my affiliate links will be short, so I can use then in text email newsletters, and some people don’t like clicking affiliate links. While there are many ways to redirect and cloak affiliate links, I am covering two: .htaccess and a software program called Ninja Affiliate. Personally, I use .htaccess, which is a fairly simple file anybody can create, because it’s quick and easy. Also, it’s free. One thing about .htaccess though is that if you enter a line in the wrong format, it can bring down your site. So always test, and if this happens, take the file down from your server while you troubleshoot. The Ninja Affiliate program program is easy to use and has lots of features, but it also costs nearly $100. Affiliate Tim Jones has been touting Ninja Affiliate since it was released last year. Every time there is some sort of phenomenon online, there are a bunch of angles affiliates can figure out to monetize it. Shortly after Susan Boyle’s appearance on the show, a Magnify.net user created a channel as a fan site, and got over 150k page views/day in less than 48 hours, according to Magnify.net. The site has been adding hundreds of members an hour (up to 8703 currently). In addition to featuring videos, the site incorporates Tweets related to Susan Boyle, as well as comments from fans. And there are a variety of affiliate banners on the site pages. This is a great example of how a quick thinking affiliate was able to grab a domain for 10 bucks, quickly setup a channel on Magnify, and drive a huge amount of traffic with an engaged community of users. There is always another big viral video coming along. Are you going to be the one to create a community and a revenue opportunity for the next one? There has been a lot of talk about the advertising tax, which is being considered by many states, but a lot of folks aren’t clear about the threat and implications. So, I’ve put together a a short video on the advertising tax. Given me two minutes of your time t find out why you need to start playing a role in the fight against the advertising tax in your state. Basically, if you’re an affiliate working with companies who don’t have a physical presence in your state, and an advertising tax bill passes in your state, you’re at risk of being kicked out of those affiliate programs. This tax is also known as the affiliate tax or Amazon tax. The gist of it is that these states are trying to require companies to collect sales tax even when they don’t have a physical presence in the state. Currently, if a company doesn’t have a physical presence, they don’t have to charge sales tax. There is legal precedent for this from the Quill Corp. v. North Dakota decision by the U.S. Supreme Court. So yes, the advertising tax is unconstitutional for anybody who cares about the U.S. Constitution. The contention by the states is that affiliates are a physical presence for these companies. You know that’s not true, and I know that’s not true, but does your state senator know that we’re just running advertising? Anyhow, this sort of bad legislation became law in New York last year, and the result was a large number of affiliate programs removing their New York affiliates to avoid charing sales tax. The state still isn’t getting sales tax from all of these transactions when merchants boot their affiliates, affiliates are losing their “jobs”, and the state naturally has less income tax to collect. If you’re an affiliate, merchant, or network, it’s imperative that you take action. One place to find information about fighting current or future legislation in your state is the Fight Against the #AdvertisingTax group on Facebook. Also, check out Affiliate Voice and the Performance Marketing Alliance for resources and news on the advertising tax. Lastly, when the vote does come down in your state, be sure to note how your representative(s) vote. And then put them out of a job at the next election if they voted against your livelihood.